At RISO, creating the best digital printing solutions is our only business, and for over 50 years we have consistently delivered high quality, reliable, and environmentally friendly products that meet the needs of our growing customer base. Our commitment to quality is a promise to our customers that our products will deliver the same performance and reliability that they have come to expect from RISO. 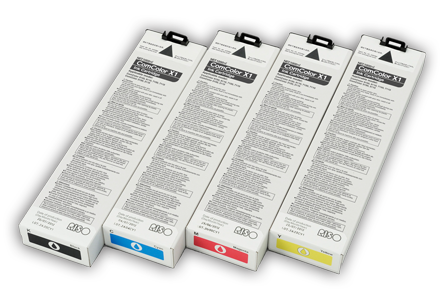 When you purchase genuine RISO supplies for your ComColor Series printer, you are assured that each product has been designed with protecting the environment - and your investment - in mind. Optimized Cartridge – The cartridge design uses a recyclable cardboard exterior and a disposable 1,000 ml ink sleeve (nozzle made from recycled plastic). This design allows components of the cartridge to be recycled and wastes no residual ink.